I think this has been discussed, but I sometimes hear people say that switches may not be located within reach of showers or tubs. I can't find any NEC issue, other than 404.4 which does not apply. Also, I have had to install bathroom receptacles in new homes that, due the vanity length and bathroom layout, are only inches away from a soaking tub deck. Other than design issues, I see no violation. First, let's be clear as to what we are discussing. -whether a tub with jets in it is covered by this section. If you're talking about your typical 'hot tub,' or 'jacuzzi,' then 680.43(C) applies, and not only need the switch be outside the zone ... it needs to be 5 feet or more away. While the language of 680 is pretty clear, and as worded it would certainly include the jetted bathtubs folks are retrofitting into their bathrooms .... I have my doubts whether 680 should be applied in a bathroom setting. Existing designs, limited spaces, and other code requirements all combine to make it nearly impossible for there to NOT be a violation. Even if the switches comply, that receptacle by the sink is an issue - but that's another discussion. 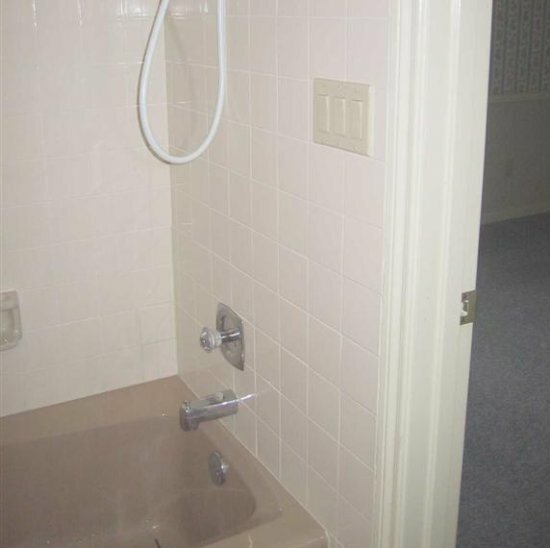 Indeed, absent a shower head ... is that really a 'wet' location, according to 404? Would using a bubble cover solve the issue? IMO, The outer switch is clearly outside the tub zone, the middle switch is outside the zone if you define the zone using the inside wall of the tub, and the inner switch MIGHT be OK, once you account for the curtain to place them out of the zone. However you define it, there is absolutely no code rule that says such switches need to be out of reach by a person in the tub or shower. What do you mean when you say the receptacle by the tub in an issue? Because the hot tub rules require the receptacle to be at least 5 ft away ... and bathroom rules require the receptacle to be within 3 ft of the sink ... and most bathrooms simply don't have any places that meet both of those rules. John, George spanked me about this a while ago, go pick out a switch. This is the commentary from the handbook that sums it up. Hydromassage bathtubs (see definition in 680.2) are required to be protected by a GFCI. In addition, all 125-volt, single-phase, 15-, 20-, and 30-ampere receptacles within 5 ft of the inside wall of the hydromassage bathtub are required to be GFCI protected. Hydromassage bathtubs are treated the same as ordinary bathtubs in regard to the installation of luminaires, switches, and other electrical equipment. See 410.4(D) for special requirements relating to cord-connected fixtures, hanging fixtures, and pendants near bathtubs. Also see 210.8(A)(1) and 210.8(B)(1) for requirements for GFCI protection of bathroom receptacles. I sometimes hear people say that switches may not be located within reach of showers or tubs. You might have seen that over in the foreign area, as that's been the rule here in the U.K. for decades: Wall switches permitted in a bathroom, but must be out of reach of anyone in the tub or shower.